Customers often ask about smoke detectors and fire extinguishers. The CSIA recommends that customers purchase at least one smoke detector for each level of the home, including the basement, and to install smoke detectors near sleeping areas. There are two basic type of smokes detectors: ionization and photoelectric. An ionization detector contains a small radioactive charge that emits an electric current to a sensor. When small particles of smoke enter the detector chamber, the current is interrupted, and the detector’s alarm sounds. Ionization detectors respond to invisibly tiny particles of smoke and provide early warning of hot, rapidly developing, open flame fires. Photoelectric smoke detectors contain a small light and photocell that are located at right angles to each other with a chamber. When smoke enters the chamber, smoke particles scatter or reflect rays into the photocell and cause the alarm to sound. Since photoelectric detectors react to visible smoke particles, they are more likely to respond quickly to smoldering fires. Some smoke detectors are battery operated while others operate form household current. Battery powered detectors are easier to install, however, the batteries must be replaced periodically. While electric models require no battery replacement, they can become inoperable during a power failure or if accidentally unplugged. Install the smoke detector according to the manufacturer’s instructions. Test the smoke detector monthly. Replace defective smoke detectors immediately. Explain the purpose of a smoke detector to children. Familiarize them with the sound of the smoke alarm, and plan and practice family fire drills. The Chimney Institute of America recommends that every homeowner have two, 5lb.-ABC type fire extinguishers. The primary location would be in the kitchen since that is where most residential fires begin. Whenever the fire extinguisher is installed, it should be visible and accessible. An extinguisher specifically designed for use in the event of a chimney occurs is a fuse-type that is ignited and put into the appliance in the event of a chimney fire. It generates a very dense smoke that is drawn up the chimney where it suffocates the fire by displacing the oxygen. When this product is used, it is imperative that the stove draft controls be closed to prevent the inflow of additional air that would dilute the effectiveness of the smoke. Lighting a fire in a fireplace vented by a cold chimney often causes excessive smoking. Homeowners can prevent this problem by following these steps. Prepare the fuel load in the firebox. Slightly open a window located in the same room as the fireplace. Roll up a sheet of newspaper, and light one end with a match. When the chimney starts to draw, light the fuel load in the fireplace. 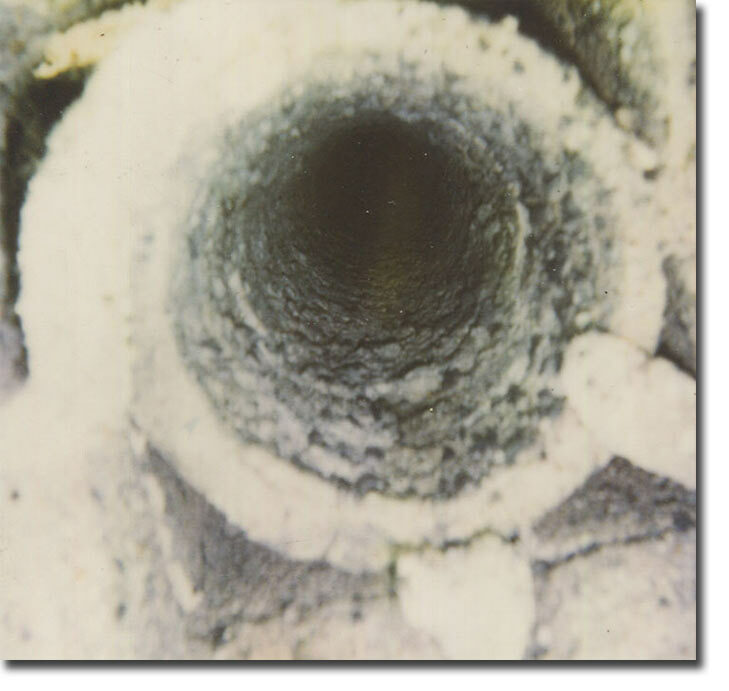 Plugs or blockages in the flue, cap, or screening. Abnormalities in chimney height, flue, or throat size. Smoke chamber or smoke shelf design. Air leaks within the chimney. Inadequate air supplied for combustion. When turned on, exhaust fans in kitchens and bathrooms or clothes dryers vented to the outside can cause smoking problems in airtight homes. Opening an outside door or window slightly often solves this problem. A better solution is to install an outside air source directly connected to the fireplace. Sometimes, fireplaces continue to smoke, even after proper draft has been established, because the flue is too small for the size of the fireplace opening. The size of the fireplace opening can be reduced by covering the opening with glass doors or by installing a metal strip across the top of the opening. Rain can damage metal fireboxes and dampers on unprotected chimneys. It can also erode mortar joints, causing eh chimney to leak flue gasses into the home to become structurally unsound. 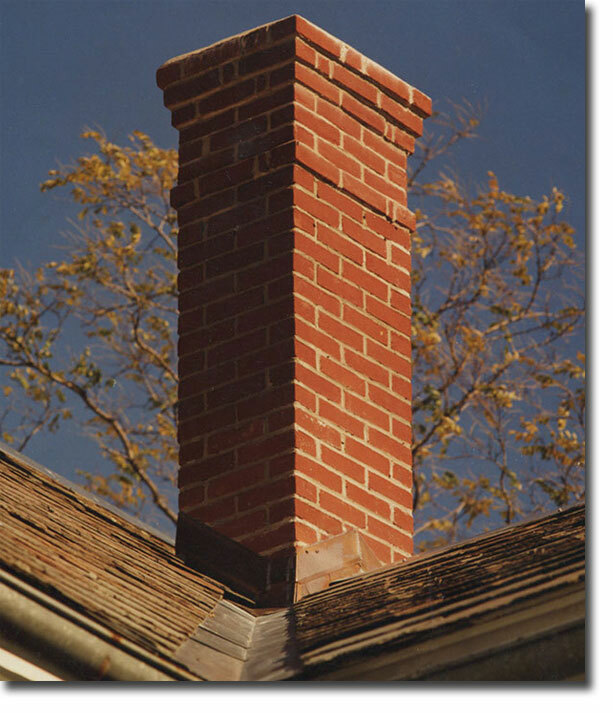 A chimney without a proper spark arrestor may allow airborne embers to ignite shingles, leaves, trees, or grass. That’s why every chimney needs a chimney cap with a spark arrestor for maximum safety and spark protection. A stainless steel or copper model chimney cap gives lifetime protection from moisture damage, keeps out critters, and protects against sparks. Loose bricks and chimney deterioration can be symptomatic of a major problem. In many cases, minor repairs done early will save huge repair bills later. In all cases, this condition should be checked by a professional immediately to avert the dangers of fire hazard or structural failure. Does my chimney need to be cleaned or waterproofed? 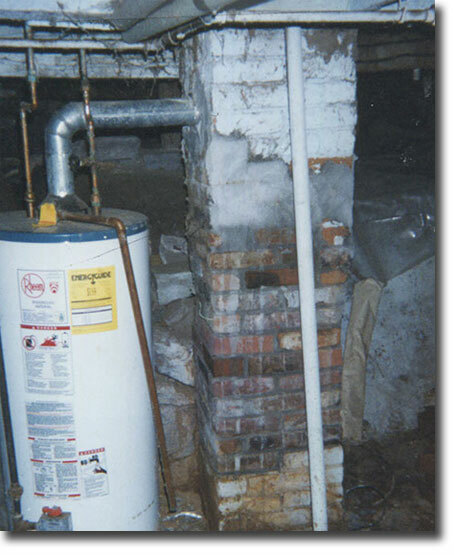 The National Fire Protection code 211 requires an annual safety inspection of all chimney systems. Here’s why: In a woodburning system, incomplete combustion results in unburned residue which rises in the chimney as part of the smoke. This residue called creosote is deposited on the inside of the chimney walls, presenting a major fire hazard to the home. Gas and oil flues should also be checked on an annual basis for any soot deposits or debris blockage which could lead to dangerous carbon monoxide poisoning. 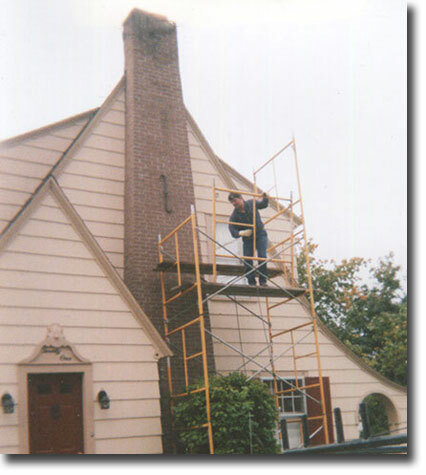 Waterproofing is the best preventative maintenance you can give the porous exterior of your chimney against premature aging and expensive repairs. Slow smoldering fires and/or the use of unseasoned wood can create “cool” smoke and weak draft. Under these conditions the smoke condenses and sticks to the chimney’s interior, forming a highly flammable creosote. A buildup of creosote is highly combustible and can result in a chimney fire. When wood is burned slowly it produces tar and other organic vapors which combine with expelled moisture for form creosote. The creosote vapors condense in the relatively cool chimney flue of a slow burning fire. 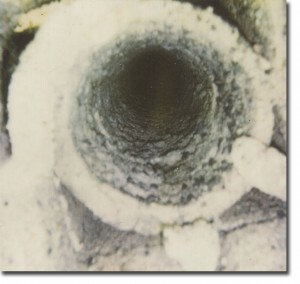 As a result creosote residue accumulates on the flue lining. When ignited this creosote make an extremely hot fire. The chimney should be inspected at least twice a year during the season to determine if creosote buildup has occurred. If creosote has accumulated it should be removed to reduce the risk of a chimney fire. 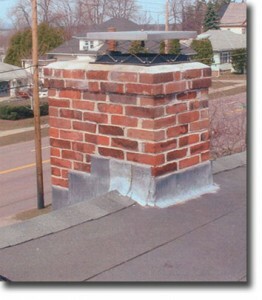 Check the specific chimney manufacturer’s instructions on removal of the chimney cap for chimney cleaning. When the fireplace is first placed in use inspect the chimney frequently and clean the chimney anytime an accumulation of 1/8” thick or more is observed on the flue walls. The frequency of these inspections can be increased or reduced appropriately after a pattern of accumulation has been established. Please not however that changes in the outside temperature and humidity, or changes in the operation of the fireplace can lead to rapid buildup of soot and/or creosote. To clean the chimney obtain the services of a qualified and reputable chimney sweep or remove the accumulation with brushes on wooden, poly, or fiberglass poles. Do not use metal pipes, chains, wires, etc., to clean the chimney because such items can scratch the surface of the stainless steel flue which can shorten the life of the flue and provide a rough surface for soot particles to attach to. In addition to checking and cleaning the chimney on a regular basis, be sure to inspect the chimney before starting a fire at the beginning of each heating season. Make sure the chimney is clear from any accumulation of soot, creosote, or any other debris and that all chimney joints are intact. do check the manufacturer’s operating guidelines for your woodstove or insert. Never use gasoline, gasoline-type lantern fuel, kerosene, charcoal lighter fluid, or similar liquids to start or “freshen up” a fire in the fireplace. Keep all such liquids well away from the fireplace while it is in use. Use solid wood or processed solid fuels firelogs only. Do not poke or stir logs while they are burning. Use only firelogs that have been evaluated for the application in fireplace and refer to firelog warnings and caution markings on packaging prior to use. Beware of burning certain materials in your fireplace. These items include plastic, poison ivy, and chemically treated woods such as pressure-treated lumber, discarded telephone poles, or railroad ties. These not lonely create air pollution, they can induce extreme illness or irritation for some individuals. Do not burn driftwood that has been in the ocean or slat water as the salt will corrode the chimney. Do not abuse the fireplace by overfiring by burning paper, cardboard, or construction materials such as pressed wood, plywood, or lumber. Some fuels, such as charcoal, natural gas, etc. give off carbon monoxide when they burn. As this is a toxic gas you should insure that the fireplace does not spill flue gas into the house. Ashes should be placed in a metal container with a tight fitting lid. The closed container of ashes should be placed on a noncombustible floor or on the ground well away from all combustible materials pending final disposal. If the ashes are disposed of by burial in soil or otherwise locally dispersed, they should be retained in the closed container until all cinders have thoroughly cooled. Ashes should never be placed in a container with combustible materials. Many chimneys appear to be in fine condition on the outside. But inside it can be a completely different situation. Yesterday’s chimneys were not designed for venting today’s more energy-efficient appliances. A look inside a chimney that appears fine on the outside often reveals a totally do=ifferent picture. There may be cracks and even pieces missing from the original clay liner. Mortar and bricks may be loose and falling, and there may be other deterioration. Chimney problems can cause illness and even loss of lives. It happens thousands of times a year. 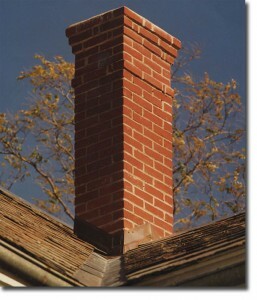 Chimney defects result in injury and death from fire and from carbon monoxide poisoning. It doesn’t take much to start a house fire. One spark flitting through a crack, or an ember igniting a chimney fire which climbs the chimney “looking” for an escape route is often enough to start a house fire. Excessive heat conducted through the chimney walls where the liner is cracked or missing is another common culprit in house fires. On the furnace side, tile deterioration can allow deadly flue gases to escape into your home through the tiniest cracks. In the severest cases there can be partial or complete collapse of the clay flue liner, blocking the flue, and spilling deadly fumes throughout the home. 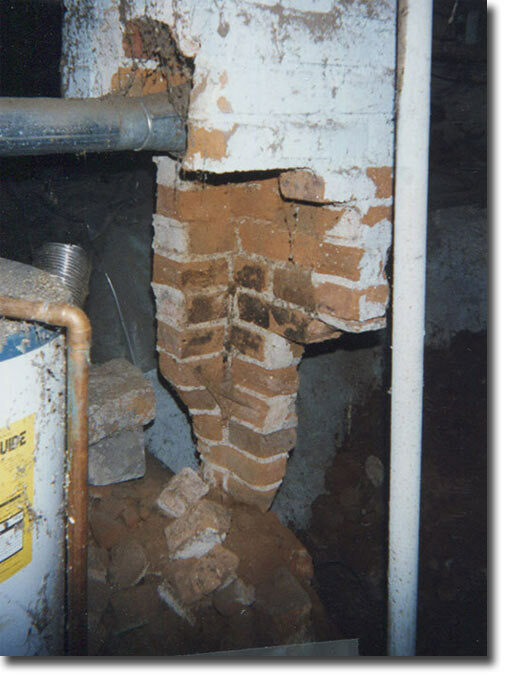 Fortunately, all of these problems can usually be corrected without completely rebuilding the chimney. The modern, higher-efficiency gas heating appliance is a fabulous engineering marvel. In the old days, low-efficiency gas heating appliances sent almost as much heat up the chimney as they put into your home. This pushed your utility bills sky-high and wasted precious natural resources. Today’s higher-efficiency gas heating appliances extract more heat during the burning process and send much less of it up the flue. But for all the benefits these furnaces offer, there’s one important side effect that must be dealt with — excessive moisture in the flue. Water is a by product of burning. When you burn one cubic foot of gas, you create two cubic foot of water vapor. Those old, inefficient heating appliances sent so much heat up the flue that the water created in the combustion process stayed in the form of hot steam all the way up and out the chimney. New higher efficiency heating appliances don’t put as much heat into the flue. The problem is, the water vapor that’s created during burning now doesn’t have the draft power to push it up and out your furnace flue. It then condenses on the walls of your chimney. And, unfortunately, no masonry chimney is designed to be constantly bathed with water, especially the acid-laden water found in your flue. The result is the deterioration outlined above. Installing a new stainless steel relining pipe will vent these water vapors efficiently and with maximum safety. While we commonly think of a masonry chimney as a permanent structure, practically impervious to damage, that’s not the case. Without a proper line and annual maintenance, the toll can be a heavy one. When the oil you heat with is burned, a sulfur soot is formed on the inner wall of your chimney. This sulfur-laden soot combines with moisture in the flue, a natural by-product of today’s highly efficient heating appliances. This forms an acid mixture which attacks your chimney, eroding your flue tiles and mortar joints. Again, the simple solution is to install a new, high-quality, stainless steel relining pipe to vent this dangerous and corrosive soot efficiently and with maximum safety.